Previous post: Happy Operculectomy Plus Shave and a Haircut Day! 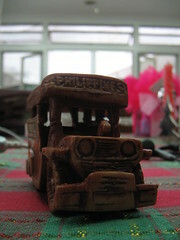 More photos of the Jeepney, that looks cool. I thought it was chocolate from the photo. Hehehe, thanks for photographing our gift! :) Happy new year!